Alcon`s Aquacomfort Plus daily contact lenses contain triple action moisturisers for increased comfort in daily disposable lenses. 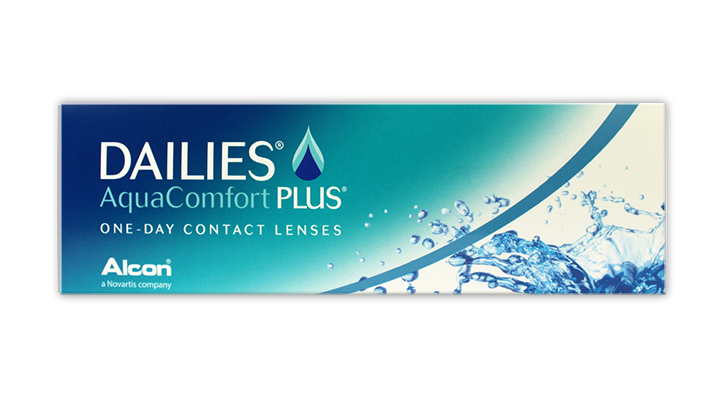 Research has shown that end of day comfort is still the biggest problem for contact lens wearers. Alcon have addressed this problem by using the same ingredients found in artificial tears and rewetting drops - a compound called PVA, plus two other moisturising agents - and building these triple action moisturisers directly into the Aquacomfort plus contact lenses. Dailies Aquacomfort Plus contains 69% water plus neifilcon A with triple action moisturising agents and are stored in a buffered saline solution. New: We have introduced a new daily lens for dry eyes and even more comfort - Crystal Aqua Daily, at a promotional limited offer price of only £5.99 / 30 lenses. Try them now at this price while stocks last! A great replacement for Dailies Aquacomfort Plus which retails at £14.99/30 lenses! great if you want to peel the lens off your eye! I suffer from quite dry eyes and for years have been using the daily acuvue moisture+ lenses. Seeing as these are new, I thought I would give them a go, big mistake! I wore them for a couple of hours today (2?) and it took me about half an hour to get the lens out of my eye as it was practically stuck! It was actually really scary! What a waste of �40. I would recommend the acuvue moisture + lenses over these any day. Ive changed from focus dailies which irritated me and have found these lenses to be excellent. Upgraded from Specsaver Elites (proclear one day) to their new Ultimates which happen to be these!!!! Amazingly comfortable - can wear them all day compared to the Elites which dried up after about 5 hours max. They break easily in your hand when you are putting them on; I can feel the lens in my eye at all times and they get dry after a few hours (3-4). They're as cheap as their cost. These lenses are pretty fantastic, never had a problem with them. these are the most comfortable contact lenses that i have ever had, and i have been using contact lenses for 35 years now.